This session with Stacey was lots of fun! We included both professional photos and some fun video clips throughout our session. It all came together beautifully in the end in this fusion video! I am loving these videos and so happy to offer them as a new option with our Senior Portraits! Stacey totally ROCKED her session! Enjoy! Categories: Seniors | Tags: barn, class of 2014, cowgirl, field, fort, ft steilacoom park, fusion video, glitter, golden hour, gone with the wind, high school, high school senior photo, jp photography, lakes high school, lakewood, model team, photo, photographer, photography, photos, photoshoot, puyallup, seattle, Senior, senior model, senior photographer, senior photos, senior video, seniors, Tacoma, university place | Permalink. It’s been so great getting to know this girl over the summer! Jackie is a Class of 2014 Senior at Renton High School. This girl can model! I can barely take credit for these shots! I have never worked with someone that didn’t need any directing on poses and getting natural shots in front of the camera. I pretty much just had to show up and she took care of the rest! …well, okay not exactly, but still, she ROCKED IT! We did both a regular senior session with her everyday clothes and adorable bubbly self, and we included two cultural looks to honor her Samoan heritage. We also made a super fun video! I just loved this shoot. Enjoy!! Categories: Seniors | Tags: adventure, beach, beach session, Class of 2013, class of 2014, cultural, culture, gene coulon, golden hour, hawaiian, heritage, high school, high school senior photo, jp photography, model team, Olympia Photographer, outdoors, pacific islander, park, photo, photographer, photography, photos, photoshoot, renton, renton high school, samoan, seattle, Senior, senior model, senior photos, seniors, stylized, sunflare, sunset, Tacoma, the cove, theme, university place | Permalink. Guess what!!!! That should be easy to do if you read the title with all the exclamation points, but… I am so excited to debut our first Senior Feature Video! Seniors, you can now include your own sweet video with your JP Senior Session! First one up is Jackie, a 2014 Senior at Renton High School. Jackie wanted to include some of her family’s Samoan heritage in her session as well as some more casual shots in her everyday clothes. Turned out to be a beautiful session with a beautiful girl, check it out! Visit the JP Senior Site or shoot me an email at jennifer@jpphotographyonline.com to get your session booked! Categories: Business Announcement, Seniors | Tags: adventure, beach, Class of 2013, class of 2014, coulon, coulon island, cultural, culture, eatonville, gene, heritage, high school, high school senior photo, jp photography, model team, Olympia Photographer, park, photo, photographer, photography, photos, photoshoot, pictures, puyallup, renton, samoan, seattle, Senior, senior photos, Tacoma, the cove, university place | Permalink. Categories: Seniors | Tags: class of 2014, eatonville, graham, high school, high school senior photo, jp, jp photography, model team, Olympia Photographer, photographer, photography, photos, photoshoot, portraits, puyallup, seattle, Senior, senior model, senior photos, senior rep, seniors, Tacoma, university place | Permalink. Meet Hannah!! She will be graduating next year from Eatonville High School. She is part of my JP Senior Model Team this year AND she does modeling through a Seattle agency. I bet I didn’t have to tell you that though, because you can see for yourself when looking at her photos that she is an awesome model! Her gorgeous friend Casey is also part of my Senior Model Team. They did their Senior Sessions together and were so much fun to shoot with. They had me laughing the entire night! Categories: Seniors | Tags: ambassador, class of 2014, eatonville, fun, high school, high school senior photo, jp photography, model, model team, Olympia Photographer, on location, outdoors, park, photo, photographer, photography, pictures, portraits, portratis, puyallup, rep, representative, Senior, senior photos, spokesmodel, Tacoma, teen | Permalink. That’s right! 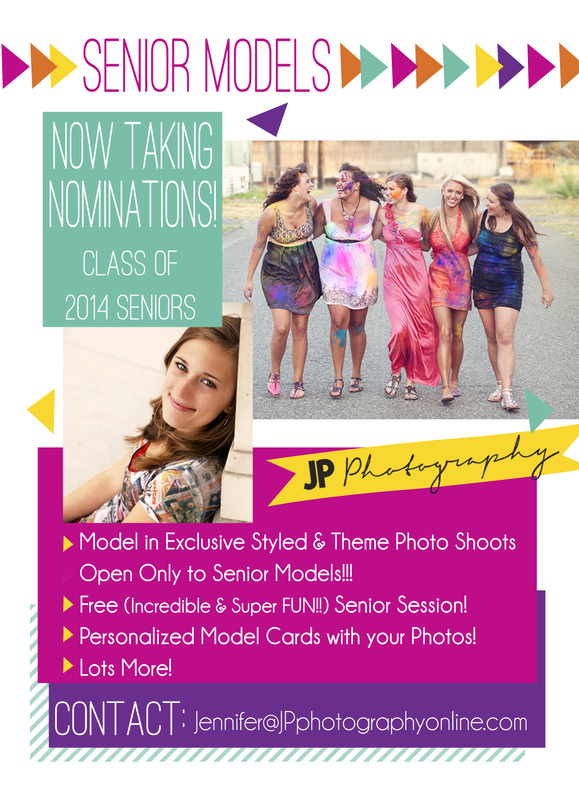 Nominations for 2014 Senior Models are now open! The Senior Model Team will have several exciting opportunities only available to them!!! We will have super fun styled/theme photoshoots, they’ll receive Model Cards of their photos, their own online gallery, and more! It is a huge way to save on Senior Photos and it’s SO MUCH FUN! I am pumped! Last year one of my styled sessions was Trash The Dress: Prom Edition. It was a blast! You can check out the photos here. To Nominate A Model – It’s Simple! 2. Include the nominee’s name and a little bit about why you think they’d be a great fit to the JP Model Team! 3. Include their email address so I can get in touch with selected models. I am so excited about this team! We are going to have so much fun! I will be selecting no more than 2 models per high school. So get those nominations in ASAP, selections have already begun! Click here to visit: the JP Senior Photography Website! Check out a sneak peek of our first JP Senior Model Shoot of the season: Click here! Categories: Business Announcement, Seniors | Tags: model team, photography, s of 2014, senior models, senior photographer, senior photos, seniors, Tacoma, tacoma photographer | Permalink.